Long-time Section volunteer Paul Thorburn was honoured for his work by IEEE Canada at its awards banquet in Saskatoon, Saskatchewan in May. He was awarded the 2013 IEEE J.J. Archambault Eastern Canada Merit Award. This honour is given in recognition of dedicated and distinguished service to the profession. Paul has served the Section in many ways over the years, most recently as Secretary for NECEC 2013. IEEE Canada (Region 7) held the Fall Regional Board meeting in Mississauga, Ontario, from the 18th to the 20th of October. The Fall Board meeting is one of two held each year (the other in the Spring) and is smaller of the two with no training component. The weekend starts with Area meetings. All Sections east of Ottawa are part of Area East and met to discuss our activities since the last meeting, upcoming plans, and regional cooperation including the planning of Distinguished Lecturer Tours. Also held during the meeting was the Area East Chair election during which Sreeraman Rajan was elected for his second term. The business meetings for the Region started on Saturday morning. During the first day a caucus meeting was held, allowing for reports and discussion without the more formal rules of the board meeting. The City of Vancouver has erected a monument to commemorate the 100th anniversary of the Vancouver Section. The monument is located in front of Telus Science World, a highly visible area. Both the Graduates of the Last Decade (GOLD) and Women in Engineering (WIE) committees will be holding congresses in parallel with the annual Student Workshop in September 2014. Both the Electrical Power and Energy Conference (EPEC) and Canadian Electrical and Computer Engineering Conference (CCECE) were quite successful this year. All committee positions for Region 7 have been filled for 2014. The incoming President for Region 7, Amir Aghdam, presented his goals for his upcoming term. The three main themes were visibility, conferences and Regional efficiency. Dr. Aghdam wants to work with other professional organizations within the country to increase the visibility of the professional especially in the areas of grant funding. He wants the Region to work to make conferences easier for volunteers to run and more conducive to participation from other countries (extending deadline to accommodate visas, etc…). Finally he has a goal to make the Region run more efficiently, including looking at the structure and costs of board meetings. The last major item of business was the budget for 2014. This year's budget was in line with previous year's with a couple of exceptions. 2014 is a Sections Congress year and as such there is an added expense of sending delegates from the Region. The budget included costs to fund 75% of the first delegate for each section and should they chose to send a second 50% of that cost. The budget also included funding for new initiatives from the Life Members Committee to revitalize their affinity groups and engage other groups during the Student Workshop and WIE/GOLD congresses in 2014. More details for these initiatives will be available in 2014. During the board meeting on Sunday all motions from the caucus meetings were approved. The next meeting for IEEE Canada is May 2--4, 2014 in Mississauga. Other notable dates for 2014 are CCECE, to be held in Toronto May 5--8, and EPEC in Calgary from November 12--14. The IEEE Newfoundland-Labrador Section Computer, Communication, and Circuits & Systems Joint Societies Chapter was formed on June 27, 2011. Since then, the chapter has actively organized/co-organized a number of technical activities. The details of the activity in 2012--2013 are provided below. Toward the end of the year, another technical activity will be organized by the chapter. Note: Cancelled due to the foggy weather that made the speaker’s flight unable to land in St. John’s airport. Several IEEE members and students volunteered in various capacities at the Eastern Regional Science Fair held at the Marine Institute Gymnasium in March 2013. IEEE member Lori Hogan and Adam Sheppard served as IEEE judges and awarded Madi Luke and Meghan Burke, from Holy Heart High School, a $100 award and plaque for their project entitled “Building an Online Shopping App”. The annual IEEE Student Night, held on March 25th, was again a great success. This annual event is held by the members of the IEEE Student Society to celebrate the graduating Electrical/Computer engineering class and present their final term projects to the local community. The Electrical and Computer Engineering Term 8 class is required to produce a final project to demonstrate the skills and knowledge obtained throughout their post secondary education. IEEE Student Night featured three team-based presentations, as well as tours and demonstrations of the projects completed by the students. 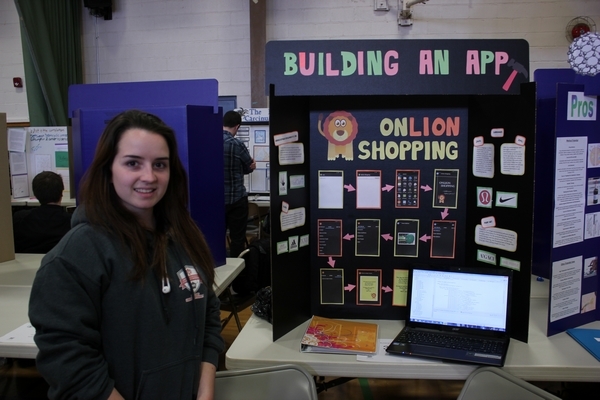 The event allowed these highly creative and innovative projects to be displayed to the public, the student body, faculty members, and judges. A reception followed allowing for some networking and relaxation. Everyone enjoyed a good night with impressive projects and an all around good time. This award, which consists of a certificate and cash prize, is presented at the Spring Convocation to a graduating student in the Faculty of Engineering and Applied Science (Electrical and Computer Engineering Program) who has had a consistently good academic record in the professional courses required for the degree and who has made a significant contribution to the Faculty and to the IEEE student branch. This year, Adam Sheppard was the recipient of this award. The IEEE NL Section Scholarships are awarded yearly to two full-time undergraduate students in Term 4 and 6, respectively. The students must be enrolled in Electrical and Computer Engineering, active IEEE student members, and of scholarship standing as defined by the University. The objectives of these scholarships are to increase the interest of the students in the IEEE, enhance a promising student's ability to succeed at the undergraduate level, and provide students with a reason and opportunity to think seriously about their professional goals. Unfortunately the Term 4 scholarship was not awarded this year. The Term 6 scholarship was awarded to William Heys. Let us continue to encourage our university engineering students to be active participants in IEEE. 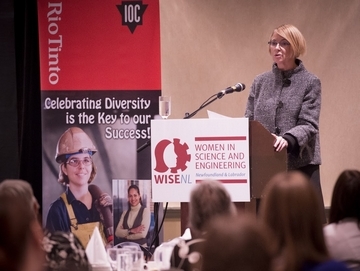 This fall, the Women in Science and Engineering (WISE) NL celebrated 25 years of contribution towards increasing the participation of women in science, technology, and engineering careers. 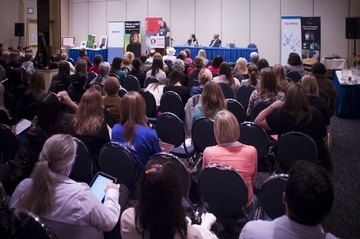 For this event, the active WISE NL branch organized a conference, featuring a keynote and two panel discussions. The plenary speaker, Greta Raymond, ICD.D, MPH, who is the Chair of the Board at the Centre for Affordable Water and Sanitation Technology, and Past Vice-President of Environment, Safety and Responsibility, Petro-Canada, provided an inspirational plenary talk for women scientists and engineers, sharing from her life and career experience. 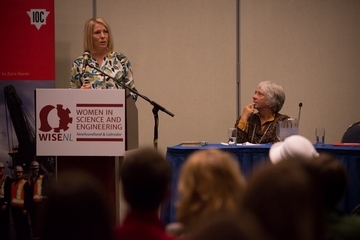 The two panels, suggestively entitled "Getting Started" and "Getting Established", provided answers to a broad range of questions related to diverse stages of women's careers in science and engineering. It was a great day of celebrating the past, while thinking about shaping the future! NECEC 2013 was held November 7, 2013 at the Holiday inn in St. John's. Once again, this year's conference was a technical and financial success, thanks to volunteers, sponsors, and attendees. The day opened with a technical keynote from Mr. Paul Snoeij from the European Space Agency, who spoke on the Sentinel-1 project. 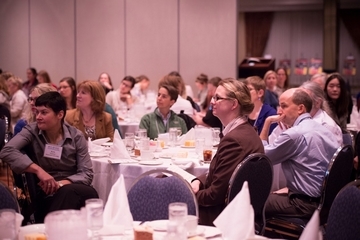 The luncheon talk was provided by Prof. Andy Fisher, who spoke on the plans for MUN engineering for the year 2020. A full slate of 52 technical oral presentations were offered throughout the day by students, academics, and industry members. An additional 13 poster presentations were viewed during coffee breaks. Wally Read Best Student Paper Award: Khalid El-Darymli, Peter McGuire, Desmond Power, and Cecilia Moloney, "Nonlinearity in Synthetic Aperture Radar Imagery"
Wally Read Best GOLD Paper Award: N. Khan, S. F. Rabbi, and M. J. Hinchey, "Modeling, Control and Experimental Validation of a Small Scale Variable Speed Marine Current Energy Conversion System"
T. David Collett Best Industry Paper Award: Reza Shahidi, "The Median Filter: Algorithms and Applications"
Byron Dawe Best Poster Award: Adel Aktaibi and M. A. Rahman, "A Hybrid technique Based Data Compression for Power transformer protection using the Minimum Description Length Criterion"
Many thanks to Memorial University's Faculty of Engineering for invaluable logistic support and resources. Many thanks as well to the sponsors of NECEC 2013. Due to increased travel commitments with his work, Jeff MacKinnon has chosen to step down as GOLD chair. The section thanks him for his service. Stepping into the role of GOLD chair is Jamie Schurmans of GJ Cahill. His education was in electronic/electrical engineering, and he works the area of power engineering design and construction. Jamie is interested in obtaining feedback from all GOLD members on what events would be preferred in the upcoming year. Please contact him via email at jamie.schurmans AT gmail.com with suggestions and recommendations. IEEE Graduates of the Last Decade (GOLD) was created in 1996 as a membership program to help students transition to young professionals within the larger IEEE community. IEEE young professionals are automatically added to the GOLD member community as they graduate. IEEE GOLD is a vibrant community of engineers, scientists, and technical experts with member representation across the globe and throughout IEEE societies. In March, the newly elected Student Branch, aided by the senior students, helped out with the annual IEEE Student Night project demos. In June, the Student Branch A hosted a tour of Fermeuse wind farm. This was done in collaboration with a renewable energy course. Both undergraduate and graduate students participated in the event. Weather during the event was foggy and there was very little wind so the participants had the opportunity to go inside the wind turbine and watch the operator change the pitch and yaw of the turbine. This allowed student to get a better understanding of the scale and practical use of wind turbines. In September, the Student Branch B hosted an industry night wine and cheese. This event was a big success with at least 30 students in attendance. Presentations were given by Newfoundland Power, GJ Cahill and Worley Parsons. Senior Students learned what career opportunities may be available upon graduation. Junior Students learned what options are available for work terms and what kind of engineering work is available. Later in October, two teams competed in the IEEExtreme 24 Hour Programming Competition. The teams worked hard through the night to solve challenging programming problems, proctored by a team of volunteers from the Section. The competition proved both enjoyable and educational to all participants and Student Branch anticipates hosting such a successful event again in future years. In November, the Student Branch helped out at the Newfoundland Electrical and Computer Engineering Conference (NECEC). The Student Brach provided 5 volunteers to help set up and operate Audio/Visual Equipment and burn of CDs containing conference material. The Student volunteers also learned about a number of electrical and computer engineering projects happening around the province.